It’s time for an update on our current favorite books. 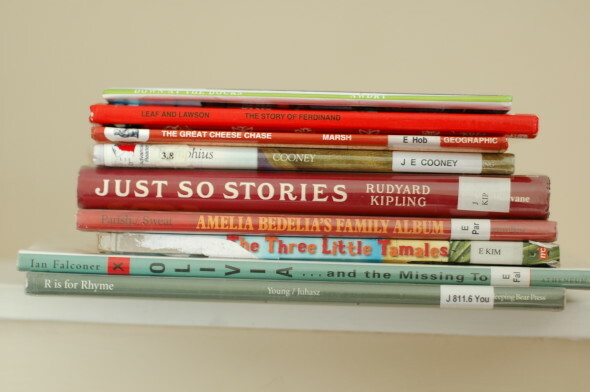 You can visit this post, or this one, to see some of the books our family has previously enjoyed reading aloud. Brown Bear Brown Bear by Eric Carle is currently my 17-month-old’s favorite book. It has been such a sweet experience to see her enjoy this book. She is not saying many words at this age, but she loves to pick up this book and point to each animal. I believe this is a great book to introduce colors and animals, and I plan to purchase this book for our home library. Miss Rumphius by Barbara Cooney is a beautifully illustrated story that takes you on one girl’s journey of seeing the world and discovering how to make the world more beautiful. I can’t believe this is the first time I have read the classic story of Madeline by Ludwig Bemelmans. Fearless, one-of-a-kind Madeline makes even a trip to the hospital look like fun. Speaking of one-of-a-kind, The Story of Ferdinand is surely that. With the support of a loving mother, he’s not afraid of being a different bull. My husband said this book was one of his favorite books as a child, and therefore I like to read it to my girls. I love how a good book can be passed down from generation to generation, unlike a most popular toys. We can all probably recall memories or feelings of enjoying our favorite childhood book. I hope my girls will remember our shared experience of reading books together. For more inspiration on reading aloud plus great book recommendations, Sarah Mackenzie’s Read Aloud Revival is a must-have resource.